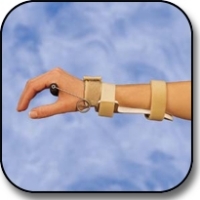 The wrist extension force of this splint is adjustable by carefully bending the lateral wires. This wrist extension splint is low profile, lightweight, and easy to apply. Tension may be adjusted at hinge. Weight: Less than 4 oz. Specify right or left side. Measure width of hand at MP joints in inches. If the hand measures between sizes, order the larger size. Post-wrist fracture, radial nerve, tendon and crush injuries when wrist extension is needed. When wrist is flexed to neutral: Size B approx. 1.25 lbs. ; Size C approx. 2 lbs. ; Size D approx. 2.5 lbs. #709BL - Small, 2-1/4\" to 2-3/4\"
#709BR - Small, 2-1/4\" to 2-3/4\"
#709CL - Medium, 2-7/8\" to 3-1/4\"
#709CR - Medium, 2-7/8\" to 3-1/4\"
#709DL - Large, 3-3/8\" to 3-3/4\"
#709DR - Large, 3-3/8\" to 3-3/4\"